If you have been curious about what you need to make strong retail sales online, read on – I’m going to explain the six things you need to have and the six things our work is going to do for you. If your business is doing well, but your brand or website is not in tiptop shape, hiring a designer is likely your best way to prepare for increased sales. I’m familiar with your beautiful work and I frequently dream about whipping my website into shape. But – to be totally honest – I’ve always been scared by the cost of building an efficient, functional, retail-driven website. Of course I know it’s worth it – I have no doubt about that. But I’m running a totally bootstrap business over here, and I’ve just never been able to come up with the money to put toward something like this. It seems silly when I say that out loud, I totally know that this is a “spend money to make money” sort of thing… but it’s a reality. This hard working business owner can’t be the only person wondering what to invest in and when, and specifically when to invest in a custom website, so I wanted to share some more info on that topic. What you can expect from having a custom site created for you? I appreciate that this is a big leap for any business. Our work is a significant investment of both time and money. I want you to leap with your eyes open and be informed about what to expect and what makes it work. A project with Aeolidia should be an investment, that is, something you pay for now that will pay you back in the future with increased sales and profit. If you’re thinking of it as an expense, that tells me you aren’t planning to leverage our work to make it pay off for you. This is such an important topic, and I like all of our clients to realize that our work is in no way a “magic bullet” that’s going to take a failing business and bring it back to life with no effort on the business owner’s part. Instead, where we are most effective is when we are able to put a high quality tool in the hands of a skilled business owner who is on her way up. So let’s think about a hammer. I could give the very strongest, best balanced, hand forged hammer to a beginner carpenter and it’s not going to make a big difference in the quality of her work. However, if a skilled craftsman has been using shoddy tools and then gets this “master hammer” built specifically for the type of work she does, she is going to know just how to use that hammer to get the results she wants with less exertion. We aim to meet you in that sweet spot where you know enough to use the tool well and improve what you do. Another stationery business owner asked me for data and stats about what her business could expect after hiring us. This is different for everyone, of course, and largely up to you. To use another analogy, you can think of your custom website as a very fast car. Once we’ve built your car, it’s up to you to drive that baby, and results are going to vary based on what you know about your own business and how much work you’re ready to put into promoting it. We want to toss those car keys to someone who knows how to race. So, what can you expect from a project with Aeolidia? I’d like to multiply your current retail sales, and the results are ultimately up to you. We like to get involved when we know our work can be transformative and trigger exponential growth. That is why we evaluate each business that asks us for a project quote, to make sure we feel that we can make it more than worth their investment. These are the six things you need to have in place to anticipate a good return on your investment with Aeolidia. You need these things whether you work with us or not. The good news is that if you are serious and smart about what you’re doing, the below should be a piece of cake. If you’re not there yet, use this list as a guide for improvement. A product that people are excited to buy. It’s best to invest in the next step for your business when you have a proven interest in your products. You want people to order enthusiastically, anticipate your new products, and share within their circles. A strong understanding of your brand, your target customer, and what differentiates your business from even your closest competitor. P.S. we can help with this! A measurable, attainable goal for the project that you will then put your energy into achieving. Do you want the site to double your retail sales? Help you triple your wholesale accounts within six months of launching? Change your audience’s perception of your business? How will you know if the project with us was a success or not? We need this marker of success as our beacon during the project. High quality content for the site, or the budget to hire us to create it. Beautiful, clear photos that answer all customer questions about the product. Copywriting that answers questions as well as sells the product. A plan for getting traffic to the site, or the budget to hire help. You can hire our marketing consultant and SEO team, or this may be something you work on yourself. Many of our clients have a plan for this or are already driving traffic to their site, and want the custom site to increase their conversion rate. A serious work ethic! The clients that we’ve seen go on to become superstars in their field do not do anything halfheartedly. They take that bull by the horns and do what has to be done to grow their business. Completely remove the “amateur” elements of your web presence, so you can confidently promote your work as a legitimate business. This can be HUGE for business owners, and the base for your work growing your company. Provide you with a website that is completely user-friendly and caters specifically to your perfect customer; something an “off the shelf” design is never meant to do. Your new site will tell your story in a way that makes your customer want to get involved, rather than just displaying your products and hoping they’ll care. Create features custom to your shopping experience. We build in the features your particular business needs to sell to your particular customers. Whether this be creating a smooth product customization process, catering to your wholesale shoppers, or eliminating tons of busywork from your internal tasks, a custom website can save you and your customers huge amounts of time and hassle. Take the confusion and drudgery out of running your website. We use Shopify (that’s an affiliate link, my friend), and we set everything up so that you can easily make your own updates to the content and products, while letting Shopify quietly make updates and improvements to the software behind the scenes. Establish you as a serious business that is willing to invest in your brand and customer experience. Even if your customers don’t know why your site doesn’t feel as trustworthy to them as the other sites they shop on – even if they aren’t design or internet savvy – they are going to have an instant “first impression” of your business based on what they see, and if it’s not totally polished and well-designed, they will click away. Society as a whole is much more design-aware than we used to be, and expectations are high. Create a “sales funnel” that maximizes conversions. Your website will be designed to lead visitors from your social media posts or Google to your home page, right to shopping, and off to the cart, without missing a beat. We know how to eliminate distractions, attract eyes to what’s important, and move your visitors to a sale. What will a strategically custom-designed brand and online shop do for you? I could talk to you about the stationery stars we’ve worked with, like Rifle Paper Co., Emily Ley, and Emily McDowell – who wouldn’t want to get there? And you know you’re not going to see any of them fumbling around with a theme from the theme store. We started working with them at the tipping point in their path, and that’s where we want to meet you. It’s going to be more applicable for you to think about the younger businesses who are more in your boat right now. One of our “valedictorian” clients is Stacia Guzzo of Handcrafted HoneyBee. Her project went AMAZINGLY, and it’s taught us a lot about what it takes to succeed. Stacia and Robert came to us because they had been floundering at craft fairs and trying to reach out to wholesale clients. Finally, at an Etsy Wholesale event, a few large retailers told them that their branding and packaging was holding them back. We started from scratch on their brand and packaging, and we completely overhauled their website. Their business has multiplied dramatically every year since we rebranded them, and they have been totally killing it. They saw a 247% increase to their Shopify conversion rate thanks to the work we did, and because of Stacia’s efforts, they also saw a 371% increase in monthly website visitors. Our professional design plus their incredible understanding of their brand and work ethic are making this a very profitable project for them. Here’s a post they wrote on how they made the decision to hire Aeolidia. Here’s a story about a jewelry designer with customizable products who increased her conversion rate by four times and her sales by seven times by making just one change to her website (then capitalizing on it with targeted social media ads)! Since launching, the Love, Georgie site is doing exceptionally well and showed phenomenal increases in revenue and conversion at our 6 month website checkup. Having a cohesive brand and easier option choices for the customer have really helped boost the team’s marketing efforts and made paid ads pay off for them. Another fun story is the husband and wife team of Island Thyme. They had been doing their own thing for years at farmer’s markets, finally decided it was time to do their brand and website right, and instantly saw a substantial increase in sales when we launched right before holiday shopping season. 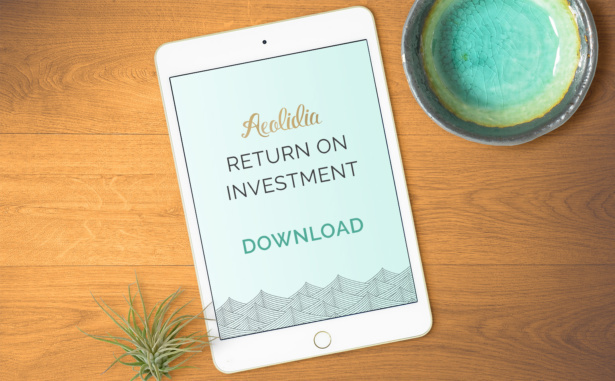 We aim for our work at Aeolidia to have a big impact and quick return on investment. Let’s finally get your brand and/or website in tip top shape to work perfectly for your customers and really capture the potential of your best sales periods. We work to get everything you need taken care of so that nothing will be holding you back when you go all out promoting your business. You’ll have a whole team on your side for two to four months, and we aim to make it a transformative experience for you. If we are going to do this, let’s do this right. With goals and objectives, and without cutting any corners. Tell me where you’re business is aiming and I’ll help you point your boat in that direction. We book in advance, so please take a look at our schedule and then request our rate sheet. If you’re not 100% sure you’re there yet, email me anyway. I would love to learn more about where your business is at and discuss your best next step.